&apos;In possibly the greatest time travel movie ever made, Back to the Future Part II, Marty McFly took a trip to the distant future (without roads): Oct. 21, 2015. It was awesome. The film promised flying cars, sweet shoes, and hover boards, but, perhaps most importantly, it promised an 18th sequel to one of the most beloved movies of all time: Jaws. 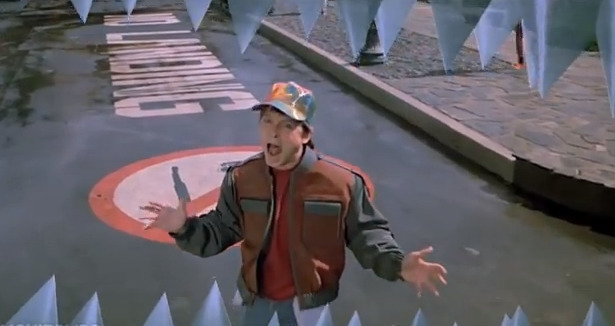 We&apos;ve already seen Jaws 2, Jaws 3-D and Jaws: The Revenge — the last of which has been called one of the worst sequels ever made — but Back to the Future Part II made a bold move by predicting Jaws 19 by 2015. Now, instead of letting that dream die, one resourceful Tumblr user is trying to make it happen. On his Tumblr "Tales to Astonish," user ctrayn put out a digital call to arms in an effort to crowd-source 15 new Jaws feature-length movies before the Oct. 21, 2015, the official release date of Jaws 19, the highly anticipated movie from Max Spielberg with the tag line, "This Time It&apos;s REALLY REALLY Personal." "As of January 2014, there are only 4 [Jaws movies]. I personally see this as an enormous travesty, which is why I&apos;m calling on the internet to rectify this grievous mistake. I challenge the geek community, the web community, the YouTube community, the film community, the time travel community, the hypothetical Jaws community, and the local community college to answer my call," he writes. The Tumblr post also points out that for a movie to be considered a "feature film" by the Academy of Motion Picture Arts and Sciences, American Film Institute and British Film Institute, it must be at least 40 minutes long. So "even if your film is 40 straight minutes of a rubber shark floating quietly in a bathtub, it still fulfills what I am asking of you in the challenge." And this is a challenge to preserve the space-time continuum, so you know it&apos;s important.